Students with a variety of backgrounds, musical interests, and talents comprise the UNC Music Composition section. Students are encouraged to find and develop their own creative voices as composers. 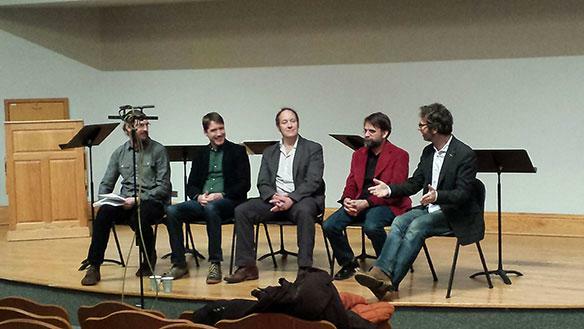 Faculty members in the composition section have received performances at festivals and concerts all over the U.S., Europe, South Africa, Australia, and Asia. Each year the Composition Section sponsors the Open Space Festival of New Music. In the past we have featured composers Christian Wolff, Alvin Lucier, Gabriela Ortiz, Jean-Claude Risset, Kyle Gann, and Paul Rudy. Interpreters have included the Callithumpian Consort, the Jake Schepps Quintet featuring mandolinist Matt Flinner, pianist Stephen Drury, French electric guitarist Jean-Marc Montera and saxophonist Raphael Imbert. Open Space 2016 featured guest composer Sean Friar, Rome Prize Fellow for 2011-12. It is a practice of the composition area to offer regular opportunities for students to hear their compositions through readings and in performance; readings are the lab experience for composers to find out what works and what doesn't. The composition section offers two recitals at the end of each semester on the final two Thursdays at 4:40 pm in which students are required to produce at least one recently-composed work in live performance. Once a year other performance ensembles such as the UNC Symphony Orchestra, the Prima Voce Singers, or the UNC Concert Band give readings of compositions by students. Visiting ensembles such as the Bent Frequency Duo Project and the Callithumpian Consort of the New England Conservatory also have offered readings with recordings for study purposes for the students. 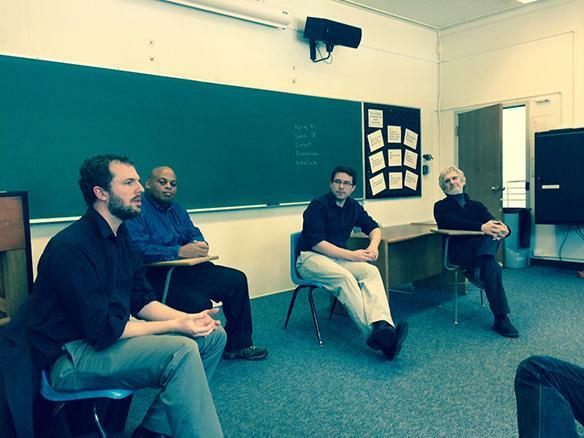 Throughout the year other guest composers and performers speak to and work with our students. In the spring of 2016 Famoudou Don Moye, percussionist and composer with the legendary Art Ensemble of Chicago is a UNC Schulze Interdisciplinary Speaker sponsored by the composition section. Other guest musicians have included composers Jonathan McNair, Aleks Sternfield-Dunn, Daniel Racer, Paul Osterfield, and percussionist Patti Cudd, among others. "Composition is introspective spelunking, imaginative trekking, and reactionary commentary, revealed through sound expression." Read more about Conner's work.